You can listen to 'Aldri Vodka, Violeta' here. It's always a pleasure to have a new Kaizers Orchestra album in the player. Ever since 'Ompa til du dør' was released in The Netherlands in 2002 I've followed the band and saw them play many a time. At the moment I'm looking forward to the next show end February. Violeta, Violeta, Vol. 3 is, as the title suggests, the third album of a trilogy. As I do not speak Norwegian, let alone the dialect Jan Ove Ottensen sings in, I have no clue what the trilogy is about, but musically there is more than enough to enjoy to make the album, once again, very interesting. Vol. 3 is Kaizers Orchestra most opera minded album to date. 'Begravelsespolka' has a huge choir dubbed into the mix which brings the song to a huge climax of emotions. As in general there are a lot of strings and horns behind the band on this album, lending the album a distinct eastern-European, almost classical flavour. 'Forloveren' is a strange mix of rock and classic showing the ambition the band has on Vol. 3. Ending with a refrain suitable for a late night singing foray in the local pub. Slightly drunk and very sentimental, this song will work wonders for pub tigers's vocal expressions. In other words, parts of this album are unreproducible on stage. The ambition is very high on Violeta, Violeta, Vol 3. Not that what I hear is unexpected. These are just influences that have always been a part of Kaizers Orchestra's music, only fully blown up to its full potential. There's no holding back here, no budgetary restraints. An interplay between band and orchestra. Including the signature estranging rhythms, guitar licks, long riffs and all. There's a lot going on on Vol. 3, as you will have gathered reading so far. 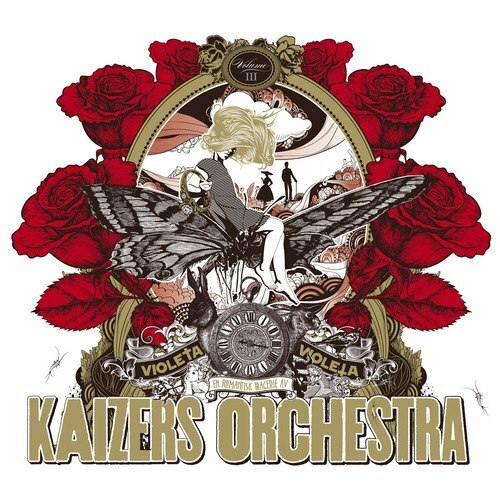 Kaizers Orchestra takes the listener through many changing moods, even within one song. Mini operas, e.g. 'Aldi Vodka, Violeta', that are so popular in the yearly Top 2000 on Radio 2, are abundant on Vol. 3. It is impossible to predict what will happen next. This makes listening to Violeta, Violeta, Vol. 3 fun, exciting and pleasing. On Vol. 3 there are less songs which I call typical Kaizers'. The extreme stop start rhythms, creating an arrested atmosphere in the songs. This is compensated by great songs like 'Siste dans'. In general there seems to have been made more use of a clear sounding piano, instead of the old pump organ, creating a lot of space in the songs. Some Chinese influences? Why not. 'Markedet Bestemmer' offers just that and still drifts into a Kaizers song. Kaizers Orchestra is able to drift in many a way, without not becoming Kaizers Orchestra. This is a very rewarding finish to the trilogy. Even though I like a few individual songs on Vol. 2 better (read our review here. ), as a whole Vol. 3 is unbeatable. Kaizers Orchestra presents itself at the top of its game. Violeta, Violeta, Vol. 3 is nothing else than a monument. Standing out in time. And I can't help but wonder, again, what would happen if De Kift and Kaizers Orchestra would ever try and make a song together... Wishful thinking? If you want to know what the lyrics and the trilogy are about, check http://kaizers.konzertjunkie.com for the translations!